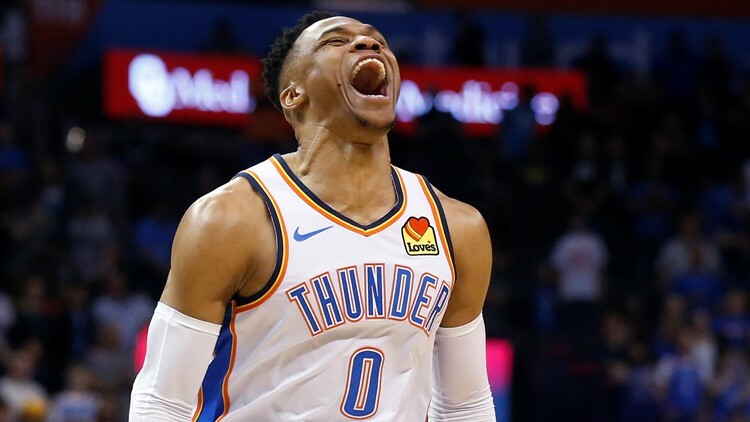 OKLAHOMA CITY — With the outcome all but decided and just over a minute remaining, Oklahoma City Thunder coach Billy Donovan wanted to get Russell Westbrook out of Tuesday's game. On the next possession, Westbrook snagged a final rebound and joined some elite company in NBA history in the Thunder's 119-103 win over the Los Angeles Lakers. "I'm not going to try to put it into words but like I said on the floor, that's who it's for," Westbrook said. "I'm going to leave it at that." "When they get what they got off of those three things, it's going to be really hard to win the game, even if you shoot the ball well like our guys shot tonight," Walton said. "I knew that he had a close friend pass away," Donovan said. "For a few guys on our team relationship-wise, it's kind of hit them pretty hard just in the last couple days. "For Russell, that was something that really, really meant a lot to him." After Westbrook clinched the mark, grabbing the rebound on Lance Stephenson's miss in the final minute, he drew a large ovation from the crowd before leaving the game for Diallo. "I tried to attack the paint," Westbrook said. "A lot of teams for me load the paint and stop me from getting to the paint, so I tried to use that to my advantage, drawing three or four people and finding open guys. "I tried to set the tone early." The loss was Los Angeles' second in the last six games despite playing with a roster missing its stars. "I thought we brought the energy level that it takes to win," Walton said. Without Tyson Chandler available, the Lakers weren't able to offer much resistance at the rim, especially early. Eleven of Oklahoma City's first 12 baskets came near the rim. "We told our guys, he's a rare player — he's not a one-man, stay in front (player)," Walton said. "It takes two, three guys walling him up. We were OK giving up jump shots, even if they hit them, to anyone but Paul George. So if you weren't guarding Paul, we should've been in the paint. "He had some rebounds where we're putting two, three guys on (Steven) Adams trying to get him off and Russ has always been a fantastic offensive rebounder." Lakers: Power forward Kyle Kuzma missed his second consecutive game with left foot tendinitis. Kuzma was joined by LeBron James, Lonzo Ball, Brandon Ingram, Josh Hart and Tyson Chandler as Lakers missing the game due to injury. . Before the game, rapper Nipsey Hussle's music was played in the Lakers' locker room. The musician was shot and killed in Los Angeles on Sunday. Thunder: Thunder center Steven Adams briefly left the game before halftime after being fouled by Moe Wagner. Adams told trainers he couldn't hear out of his right ear. He shot free throws before heading into the locker room. Adams started the second half. . Earlier Tuesday, the NBA rescinded the technical foul Russell Westbrook received Sunday in a loss to Dallas. It would've been Westbrook's 17th of the season, pushing him one away from a second one-game suspension. . The Thunder have trailed at halftime in 17 of their 20 games since the All-Star break. . Former Thunder guard Alex Abrines, who was released in early February, was at the game as a spectator.